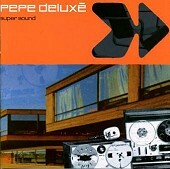 Hip-hop gone electronica with plenty of samples and even a bit of underlining pop, Pepe Deluxe's Super Sound is exhilarating, delivering plenty of gust and excitement throughout the sixty-three minutes of music on the album. The songs come at you with sonic vibes, forcing you to dance, 'cause if you resist, you'll find the intoxicating vibes too dangerous and too intimidating to ignore. So, either way, they'll get you to dance. Very stylish and very enchanting, the songs will wrap you up and find you tangled in their intoxicating beats. I'll give it a B+.